I promise that I love my Mom, but I have spent yet another Mother’s Day weekend in my shop. All of the good sons and daughters spending time with their mothers means that the traffic on 95 is pretty light and the shop is that much easier to get to. For this weekend, I focused on finishing up my second workbench and finally starting the finishing of a project that isn’t a lamp. The workbench is a pretty straightforward project. I already had the base of the bench from a prior piece of furniture. Building the top takes a few weekends; not super difficult, but time consuming. It’s not the best piece I’ve ever built, but it has already made my shop much more efficient. That project was finished on day 1 of the weekend. Day 2 was spent finally getting a new cabinet ready for finishing. I’ve had the majority of the cabinet completed for weeks months. I’ll miss having it as something to rest my sanders on, but it’s time to get this one out of the shop. In the photo below it is sitting on the new workbench after being sanded to 120. I eventually sanded it down to 220, but before the final sanding I wanted to fit the door to the cabinet. The only challenge that I came across was the length of the screws for the hinges. Ultimately, I had to snip off the tip of each screw, so that it wouldn’t protrude from the side of the cabinet. The proportions may look a little off to people, but this is a purpose-built piece of furniture. 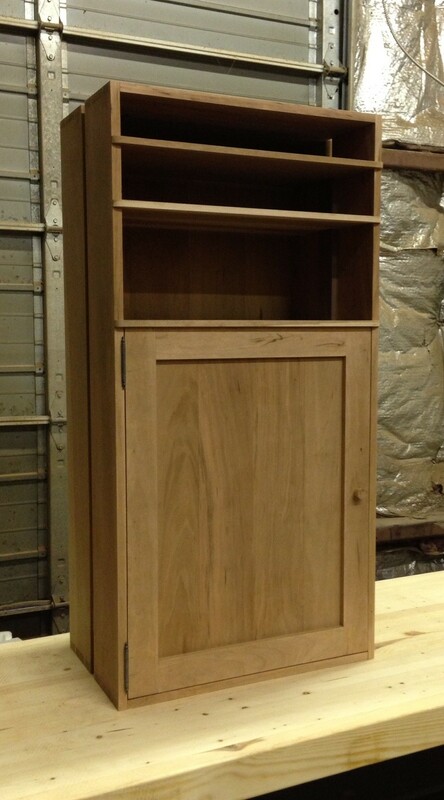 The cabinet will sit in an opening between a wall and a desk. The door is design to swing open beneath the apron of the desk. The large opening above the door is going to be completely concealed by the desk, so it will store items that I don’t need to access. The top 2 shelves are for computer equipment, and will sit at or above the top of the desk. Categories: WIP | Tags: cabinet, cherry, dovetails, WIP | Permalink.